Picked up a bunch of the panels at a show today. Came with two boxes of houses,trees,fences,light poles and tunnels. Looks like one panel may have had a whistling billboard but it is missing. Im sure there are some other pieces broken or missing. Who is a good source of parts for these? Here is a photo of the train that came with the panels. Check e-bay. I know a few years ago I picked up additional parts for my scenic panels from e-bay. There was not a whistling billboard with these. There was a whistle in one of the houses that was the same mechanism as a billboard. The whistle unit was screwed to the panel and the house set on top of it. Yes I found out today that the spot where I thought the whistling billboard went is actually where the transformer sat. I have never dealt with the panels before so I am still learning. Tested the loco that came with the panels out today and it runs and smokes fine. Just needs a light cleaning and lube. Also the tank and gondola car each need a truck replaced due to broken couplers. Ebay is a good source, but I've had most of my luck at train shows where I can see the parts and make sure they are not broken or cracked. My first set was the All Aboard set with 8 panels. Still have it, but had to replace quite a few trees, street lamps and other signs as well as epoxy some panels that got stepped on and cracked. I am repairing the whistle panel as well as the underneath wiring on the panels. I think that Train Repair Parts still has some panel parts as well as Portlines. 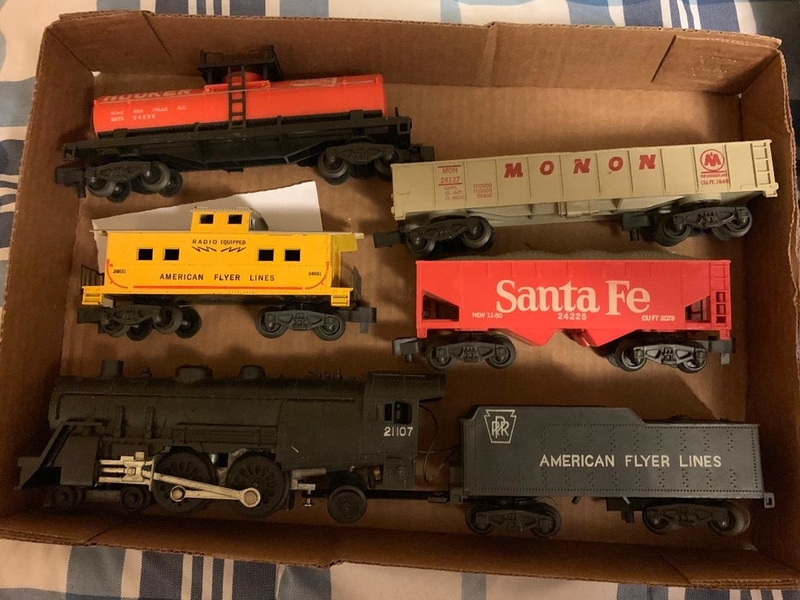 I had been thinking of building a portable layout using standard Flyer track to take to local shows but now that I have these All Aboard panels Im thinking of just restoring them and setting them up at shows. I know I wont be displaying the better years of Flyer but it may enough to get people interested in the brand and the hobby. I have several All Aboard sets and their operation is not all that great due to the track.If you are entertaining the idea of a display layout you may be better off replacing the Pike Master track with a flex track such as GarGraves.I am sure it will perform better and actually look better.Just a thought..
Im going to give the Pikemaster track a good cleaning and try to retain it for originality. But if it gives me problems I will change it out. I agree with Major about some of the modular layouts at shows. Track on bare wood is not very appealing. At the show where I purchased the panels there was one HO layout and I think one N. O or S was not represented. I found that while an American Flyer locomotive might slow down on Pike Master track on the all Aboard panels due to connectivity issues, a American models or S-Helper will not. This is probably due to the fact that AM & S-Helper draw far less current. I had a section of track between a crossing and a switch where AF locos always slowed down but AM and S-Helper locos did not. I corrected this issue by adding a feeder wire to that track section. This was easier than removing and replacing the track.